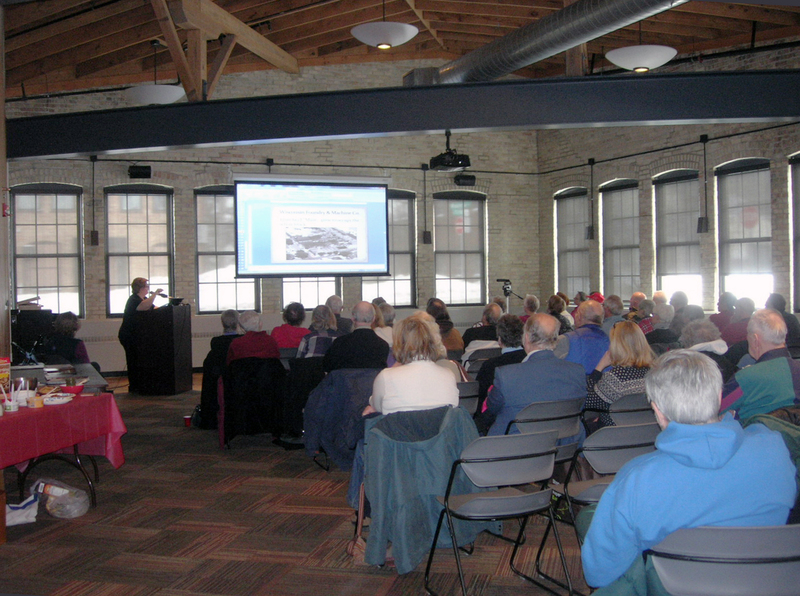 Mary Clark of the Dane County Historical Society presented slides about the foundry’s history. The Wisconsin Foundry was incorporated in 1910. Its plant was located at 613, 617, and/or 623 Main street-accounts differ. It eventually spanned the block and employed 80. Founders George Washington (G.W.) Botham, Joseph Eisele, and August Buenzli all lived within a block of each other in the 1300 block of Rutledge (just east of Baldwin). The company claims to have its roots in the Ball Bro’s Foundry, est. 1860, which made cannon balls for the Union Army. Three generations of Bothams ran the company: G. W., his son Dorsey L. , and his son Dorsey J. better known as “Tuck”. Wisconsin Foundry was most known for its road machinery & equipment, and conveyor belts used in rock quarries and canneries. The work inside the plant was dark, hot, sooty, and probably dangerous. During World War II the foundry supported the war effort in two ways–they serviced equipment for Truax Field and other military instalations, even road building equipment used in Alaska. They also manufactured parts for gun mounts used by the Army and Navy, including an ingenious gizmo that allowed a gun designed for a bomber airplane to be mounted on a vehicle. During World War II the workforce doubled. 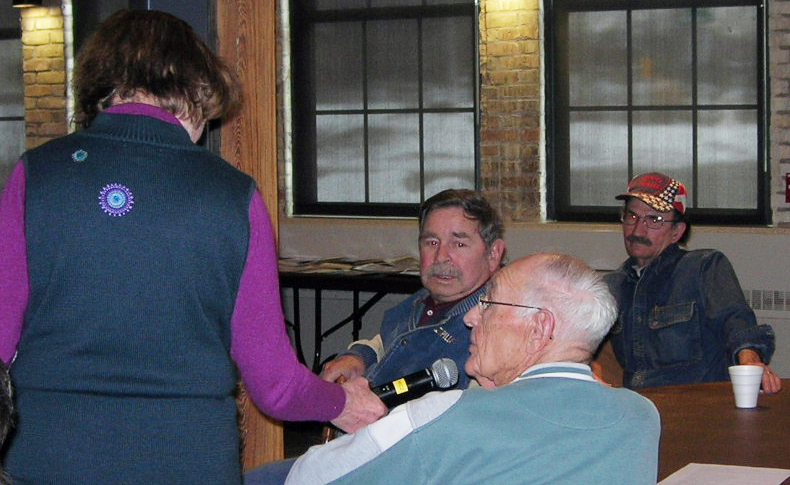 One third of Wisconsin Foundry’s employees went to war and had to be replaced. A sideline was factory supply–which was spun off as the Wisconsin Supply Co. in the 1940s, with offices on West Mifflin St. and later West Main St.
Wisconsin Foundry was a Union shop–Machinists Local 1406. In the 1950s the company made crane booms for the construction industry. By the 1980s they were doing custom repair and construction of decorative ironwork. On March 19, 1993 it closed operations, dismissing the last 8 employees. 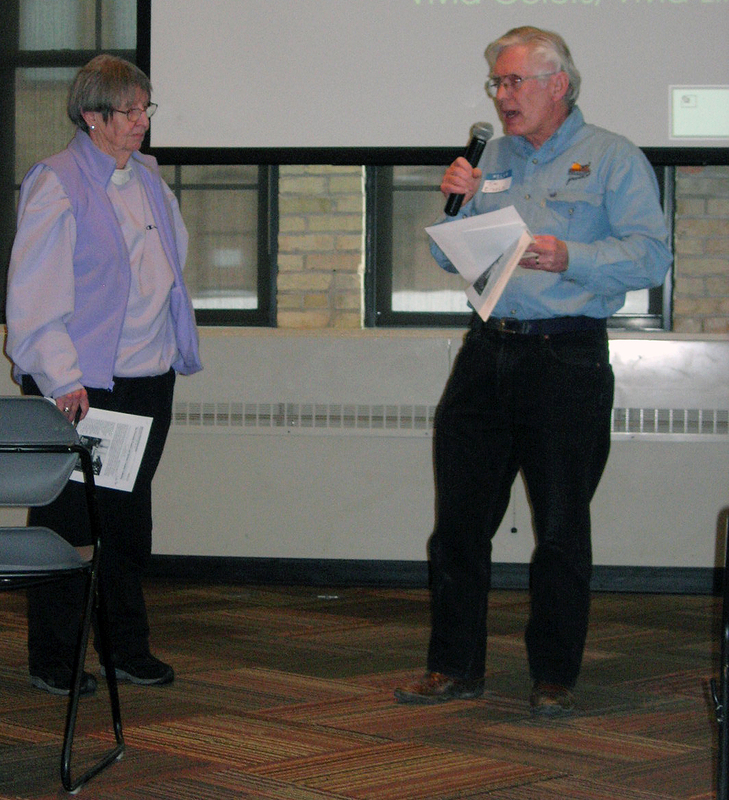 In 1995 the company papers were donated to the Dane County Historical Society. The collection which ends in the 1970s, consists of sales catalogs, photos, and other documents, many of which are very dirty from the soot in the plant. Employees Jerry Feisst, Tom Minter, and Edward Denman described it as a good place to work, with Union benefits–health insurance, cost of living raises, and a pension. Ann Waidelich interviews Tom Minter. In foreground is Jerry Feisst; in background, Edward Denman. If you see a manhole cover in the greater Dane County area–and even as far as Dodgeville–look closely for a Wisconsin Foundry mark. Also sharing reminiscences were descendents of the founders, Betty Lou Botham (daughter), and Eiseles: Helen (daughter) and Tim (grandson). 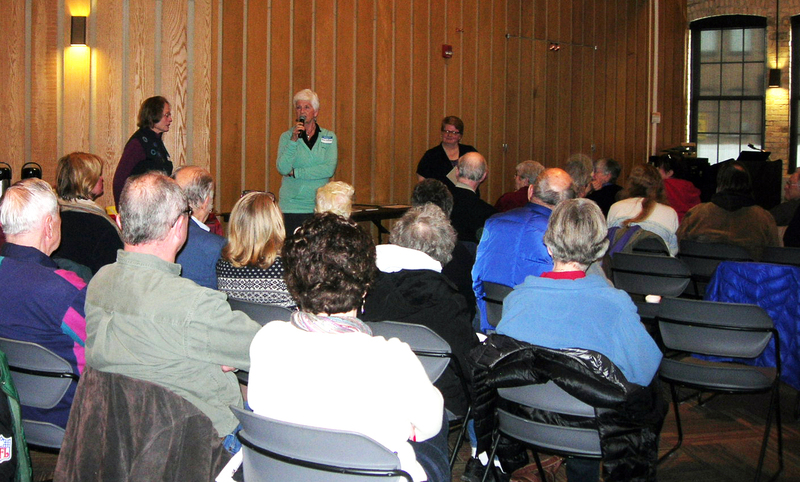 Betty Lou Botham (in green sweater) speaks with Ann Waidelich and Mary Clark. Two generations of Eiseles–Helen, daughter and Tim, grandson of founder Joseph Eisele, share memories. It is part of the East Side’s history–and charm–that captains of industry and common working men all lived and raised their families in close proximity. Saturday February 15: Wisconsin Foundry & Machine Co.
Wisconsin Foundry & Machine Co. in the 600 block of E. Main Street. Note MG&E smokestacks in background. 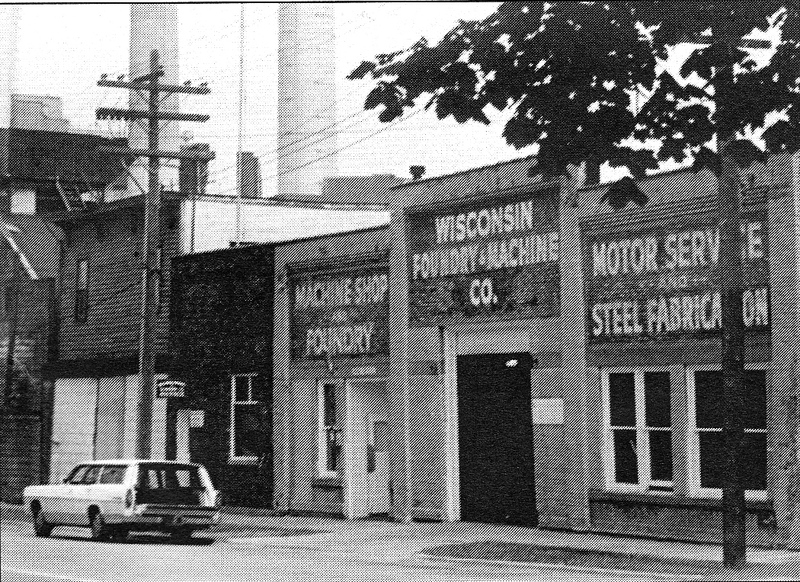 The Dane County Historical Society will lead a discussion of the Wisconsin Foundry & Machine Company, located at 613-629 East Main Street from 1910 until 1993. This meeting will include a roundtable discussion with some of the men who worked there; we invite you to join in if you were one of them! The DCHS’s collection of Wisconsin Foundry photos and company papers will be on display.